We went to Maple Grove Community Center today with a couple of friends from our ECFE class to celebrate Lily's birthday! I have been looking for an excuse to get to the pool this winter, so this was perfect. Parker had a blast! He was so excited to be in a giant bathtub! I got a good workout trying to keep him from going under. I can't wait to go back again! 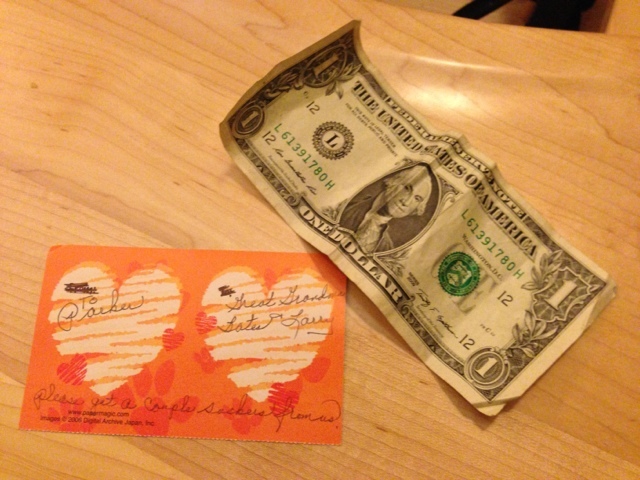 Parker's Great-Grandma Bette sent him some Valentine's love! This is his first official Valentine! 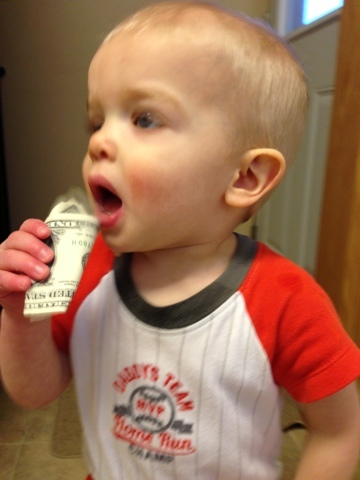 It looks like he is eating the dollar, but he was actually getting ready to chuck it on the floor! I love this kid so much! Happy Valentines day all! Snow storms make me want to hunker down with my boys! Hunkering down can sometimes lead to strange activities... Lucky for you I created an awesome video of today's activity! We love our hardwood floors, but balls just go everywhere and end up in the hardest places to find them. One of those places is the space between our sofa and end table. Jimmy thought it would be a good idea to fashion a shield out of mega-blocks. See your yourself how it turned out. 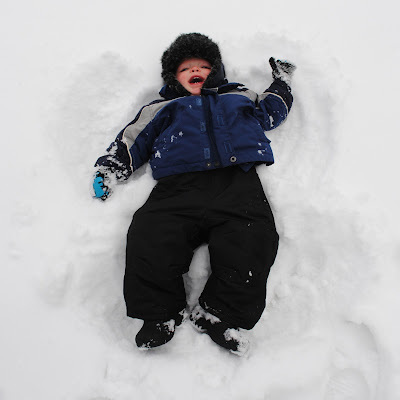 Shortly after posting, I realized I never blogged about Snow-venture #1! There wasn't much to it. It took longer to get dressed than how long we were outside. This picture pretty much sums it up! We finally got some more fluffy stuff over the past few weeks and I have been wanting to try sledding again with Parker. 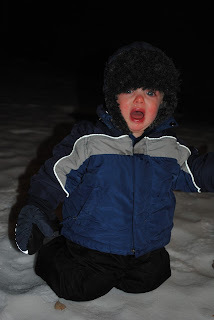 It was icy and crunchy last time so he was NOT a fan! Today was a great day to get out because it was almost 30 and we are supposed to get a big storm tomorrow. However, being in the snow was not a happy time. A quick game of peek-a-boo got a smile out of him! Back in the sled for another round, but he was not having it! A little outside time must have been the kicker! He conked out for 2 hours when we were done. Hopefully he warms up to snow (pun very much intended!) He will have to living in MN! We have a little wall at our house that we usually hang winter/Christmas decorations on. The rest of the year the hook just stays there all alone! I though it would be fun to make more seasonal decorations to rotate throughout the year. Pinterest to the rescue! I found this cute little idea from The Peanut Paintshop. I had the craft paint on hand so I was able to make this one for under $10! I am already brainstorming for St. Patty's Day and Spring! It has been such a busy winter so it's nice to have some time for crafting!